It's been less than a day since Google unveiled the Chromecast, and after both virtual and physical dashes to the store, it's worth pausing to see how the dust has settled. Many of us couldn't help ourselves and may have accidentally bought two as impulse buys, but there are bound to be some of you who needed a bit more time to come to a decision. Here's how the landscape looks. I'll cut straight to the bad news - Amazon is sold out. Best Buy was your best bet until just recently, but now the device is sold out online there, too. You can still check your local store and see if you get lucky. Otherwise, you have other options, but you might not like them. The Play Store isn't sold out yet, but new orders won't ship until three weeks from now at the earliest. The shipping costs are definitely pricier than at either Amazon or Best Buy, but that's just how the cookie crumbles sometimes. If you just can't stand the wait, or don't live in the US, you can also turn to eBay. 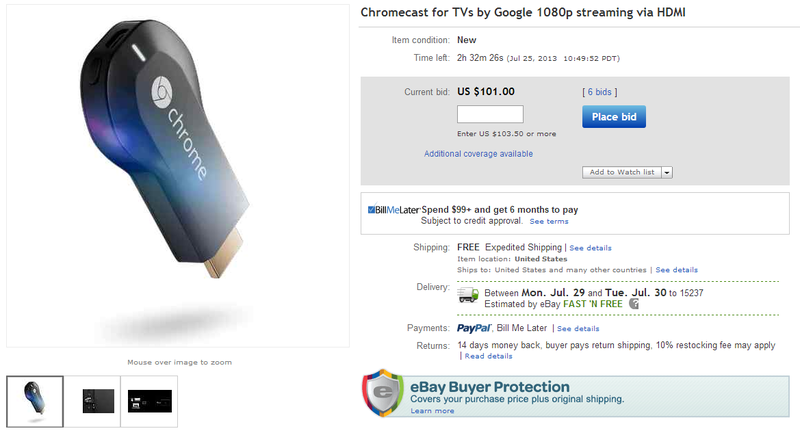 I hear Chromecasts are going for just over $100 right now. And that's the current state of affairs. 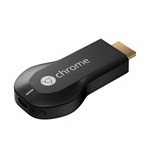 To anyone still trying to get their hands on a Chromecast, happy hunting. If all else fails, there's always patience. These things will eventually show up on store shelves, and any kinks are more likely to have been worked out by then.